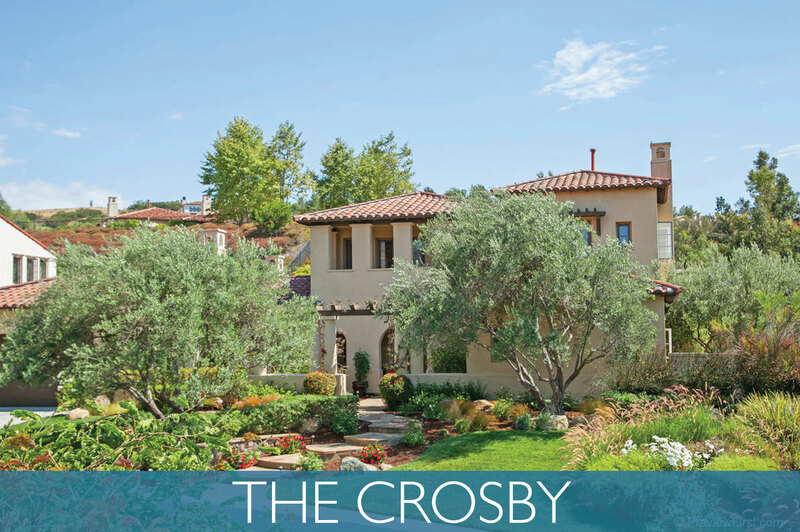 The Crosby at Rancho Santa Fe is a luxurious, 722-acre, gated, golf community named after Bing Crosby. Bing Crosby and his family formerly owned the land and the streets of the development are all named after songs or movies Bing made famous. The community offers 443 residences including villas, semi-custom homes, and custom home sites all surrounded by an 18-hole private golf course and country club. View more about The Crosby on Pinterest! Entrance to The Crosby Estates is through the gates and across a spectacular 340-foot bridge over the San Dieguito River. The dramatically inspiring bridge is graciously detailed with lampposts and artistic s-shaped iron railings, while cascading ledger stone walls and colored and scored paving evoke the romance of early California architecture. Homeowners within The Crosby enjoy the finest of private country club living. The community maintains 24-hour gate guards, offers sweeping fairway and territorial views, and includes several private parks, walking, and hiking paths as well as a picturesque lake park. Stucco particos with red clay tile roofs express the early California and Rancho Santa Fe theme connecting bridges to the community's walking trails. The San Dieguito River valley borders the western portion of the community, offering natural coastal sage scrub, riparian forest, oak and eucalyptus woodlands, marshes, and wetlands. The land itself is a sweeping landscape with canyons, ridges, and steep slopes. Over 190 acres of land have been designated as open space to preserve the San Dieguito River and surrounding wetlands. The centerpiece of the community is The Crosby National Golf Club. This Private course features an 18-hole, par 70 championship golf course designed by PGA star Fred Couples and golf course architect Brian Curley, a 32,000 square foot clubhouse, a junior Olympic swimming pool, full strength and fitness facilities, and an incredible tennis complex. The tennis complex is highlighted by The Tennis Garden with its sunken stadium court and several additional hard courts and tennis shop.